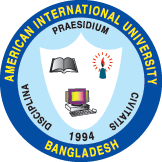 The International Association of Universities (IAU), UNESCO, Paris in collaboration with the American International University-Bangladesh (AIUB) organized an internal workshop in the university on 25 January 2016. The workshop is one of the activities designed to promote, advocate and expand internationalization, enhance and strengthen its strategies to meet the needs and requirements of the students, faculty and the university as a whole. The launching of the International Strategies Advisory Service (ISAS) provided an opportunity for AIUB to avail of this global initiative. Spearheaded by Eva Egron-Polak, IAU Secretary General, Dr. Anna Ciccarelli, IAU Board Member, Prof. Dr. S. M. Kabir, Quality Assurance Expert and Giorgio Marinoni, Manger, Higher Education and International Policy and Projects, IAU, this team of experts had intellectual exchange with the Deans, Program Directors, Department Heads, administrative officials and faculty by having a stimulating Q and A on internationalization. Selected students from the different clubs and organizations were also given the opportunity to express their insights and overview of the internationalization initiatives of the university. Diverse questions and information sharing dominate the workshop which was opened and facilitated by the Pro Vice Chancellor, Prof. Dr. Charles C. Villanueva. Later in the afternoon, the team met the Vice Chancellor, Dr. Carmen Z. Lamagna, the Treasurer, VP Administration and HR, Dr. Hasanul A Hasan shared the previous and current efforts of the university in infusing internationalization in the various dimensions of the university’s academic and management system. A courtesy visit was also paid to the Chairman of the Board, Mr. Isthiaque Abedin who is at the same time the VP for International Affairs of the university. Prior to this workshop, the university conducted a self-assessment exploring the various concerns and areas where internationalization are being practiced and observed. A report was submitted to IAU in advance to provide the experts an overview of the internationalization process on-going in the university. The workshop provided substantive information that reinforced what were reported in the self-assessment using a pre-structured questionnaire. The experts expressed overwhelming appreciation to the IQAC, the members of the steering committee, key officials, faculty and students who were all cooperative and facilitating so that the proposed framework for a substantive and viable international process can be carried out to benefit the university in a short and long-term perspectives.